The world of Spira, where he finds himself, is home to its own cultures, rituals, and creatures. There are elephant/dinosaur hybrids, ridden by mahouts who resemble blue versions of Jar-Jar Binks. There are island folk who live in terror of Sin, the same monster that upturned Tidus’ life. 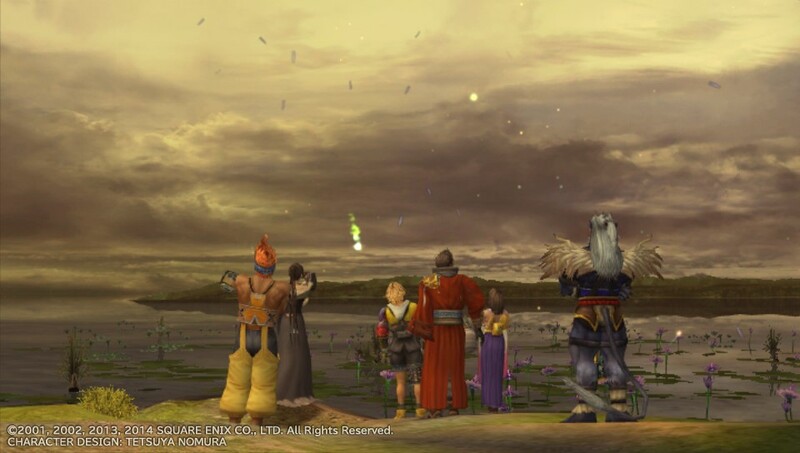 There are ice forests, mythical heroes, prayers, salutes – all of it as new to Tidus as it is to us. When he discovers a group of people playing blitzball, his delight is understandable – it’s the first touch of home he’s seen. Tidus’ quest begins in earnest once he meets Yuna, a young woman on her own journey to fight Sin. There’s more here than “kill the foozle, save the world”: Yuna is a summoner, one of the few who can stand up to Sin, and in Spira, that’s an almost religious position that confers responsibility along with respect. In one area, Yuna is mobbed by an admiring crowd; in another, random NPCs gift you equipment “for the lady summoner” – a neat way to integrate gameplay and story. As we watch her deal with her role, we get a sense both of her character and of the society around her. Running through this are three themes. The first is originality: so far there are no elves, dwarves, evil emperors, or other immersion-shattering clichés. The second is a grounded, personal feel – it helps that we learn about the world alongside Tidus. The third is internal consistency, both in the world and in the way characters behave or respond to each other. It makes sense for Yuna to be treated as a hero, given the magnitude of her task. It makes sense to encounter NPC summoners on their own quests to defeat Sin – finally, an RPG acknowledges that the player doesn’t control every hero in the world! And it makes sense for those around Yuna to react to Tidus – the blundering, confused outsider – in different ways, some more accepting than others. This adds up: FFX feels convincing, just as good fiction should. To my surprise, though, it doesn’t just succeed as a story – it also succeeds as a game. FFX features a seemingly simple but well-designed turn-based battle system, and I will discuss this in a future post. (1) Not helped by a bratty voice. I’m pretty sure this was intentional – a more mature-sounding Tidus provides the game’s narration. Previous Previous post: Clippings: It’s Pretty!